I attempted this photo a couple weekends ago but a storm rolled in and there was no color in the sky. I didnt even bother leaving our ski cabin to go shoot. Finally this last weekend the weather looked great and I had a chance to drive up to the north-east shore and find Bonsai Rock. To find Bonsai Rock park at 39.183690 , -119.927088 and then climb down the side of the hill to 39.184844, -119.927727. More detailed directions if youre trying to find it: The parking location is about 6.7 miles north of the highway 28/highway 50 junction. Theres a small turn-out on the side of the road (on the left side of the road if youre heading from S. Lake Tahoe. If you get to what looks like a highway rest stop on the right youve gone too far. If youre coming from North Lake, its on the right, just past Sand Harbor after the rest-stop thing on your left). If you want to throw in your GPS coordinates the parking spot is pretty much exactly at 39.183690 , -119.927088. Once you park you have to hike down a steep hill slightly north of where you park. A lot of people mentioned that it was a steep hike but I never realized that it was about a 200 foot climb down to the water. It wasnt extremely difficult to get down, but we did have to hold onto some trees/roots/rocks to make sure we didnt slip and tumble into an injury. Getting back up after the shoot was a decent workout (note: if youre going at sunset, I recommend that you DONT forget to bring a flashlight). 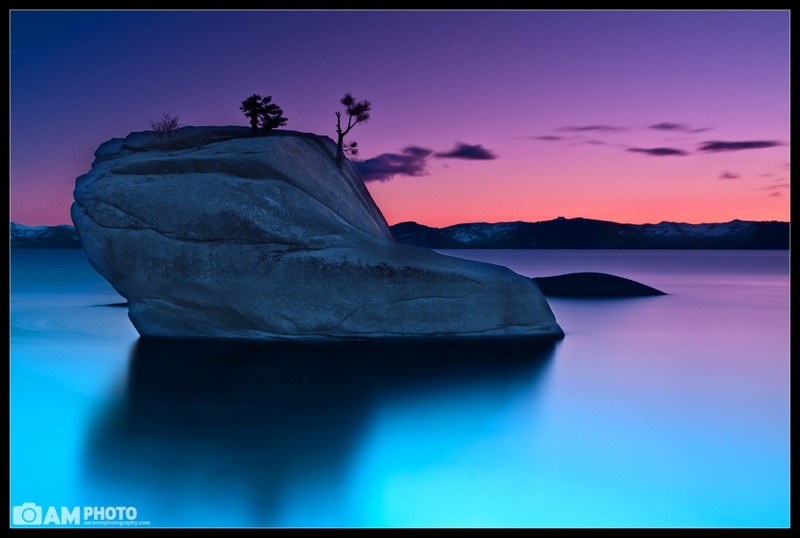 Bonsai Rock itself is located at 39.184844, -119.927727. Mike Wiacek (http://www.mikewiacek.com/blog/2009/08/bonsai-rock-formation-lake-tahoe/) has been so kind as to create a custom Google Maps for Bonsai Rock. Check it out at http://maps.google.com/maps/msieUTFmsa0msid117078272024675730991.000471c9db1839af7e9e6. BW F-Pro Circular Polarizer, HiTech 0.9 Graduated ND, Hitech 0.9 ND Soft, and 0.6 ND Soft.